Had it not been for grad school, it seems unlikely I would've ever read any work of Elizabeth Gilbert's. All I had known of her previously was that her name was attached to a certain popular book that was of little interest to me. During a lecture at my first residency, Gilbert's TED talk on “genius” was presented and my opinion shifted drastically. Gilbert was brilliant and well-spoken. (If you're a writer, or an artist of any kind, I strongly recommend watching it: watching it). The TED Talk wasn't enough to have me running to the store to pick up a copy of that one book, but was more than enough to put Gilbert on my radar. 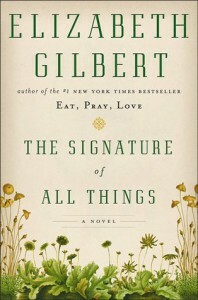 The Signature of All Things, Gilbert's most recent, shows the author's talent—er, genius. 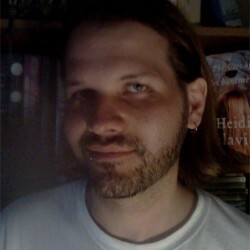 It's luscious and well-written. Although I know almost nothing about Eat, Pray, Love, I imagine it must have been a very different book to attract the following it did. The Signature of All Things is intelligent and certainly thought-provoking, but it is far from riveting. There is a considerable amount of botany in these pages, and readers who find digressions by an author into science WILL find themselves bored repeatedly throughout this novel. Overall, the novel dragged on a bit and could've been pared down some, but it was a pleasure to live in for a time. Fans of epic, detailed historical fiction will eat this up; readers of travel memoirs—not so much. Certainly, The Signature of All Things shows Gilbert didn't let the pressures of a follow-up to Eat, Pray, Love get to her too much. Brava, Ms. Gilbert, and olé to you.